When I first arrived at Likoni Community Development Program (LICODEP) I was not sure which direction my internship would take. Located just south of Mombasa, Likoni is a bustling community with a rich culture and a diverse set of development issues. LICODEP is the flagship community development organization in the area and they work on issues ranging from advocacy to public health to microfinance. After several weeks of observing and trying to find my niche, I decided the way in which I could have the biggest impact on the community’s development was to help develop a small business management class with LICODEP’s fledgling microloan program, Mikopo Ni Maendeleo (MIMA), which means “Credit is Progress”. I was impressed by MIMA’s staff and clients, all of whom have come to entrepreneurship for different reasons and had to overcome serious obstacles. Having started just a year ago through the work of another FSD intern, the program has been serving its clients very well. It started with just 50 clients last September and has over doubled its clients since. The clients join MIMA in solidarity groups of five, usually consisting of friends, neighbors, and sometimes family members. They meet each week with a MIMA staff to contribute their mandatory savings and discuss the status of their loans as well as who will be next to apply for the loans. In addition these groups serve as support for one another on various business issues. 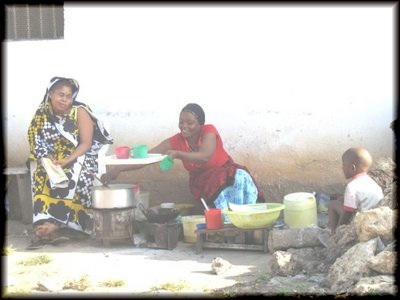 This program serves a wide range of clients, most of whom are women running microenterprises with in the Likoni. After conducting a survey of clients, we found entrepreneurship is one of the only viable options for many individuals, especially women. Unemployment in the area is estimated to be as high as 48%, according to Action Aid Kenya. The jobs that are available often require higher degrees or specialized training, options which are out of reach for the poorest individuals in the community. It was only five years ago when primary education became free in Kenya, so MIMA clients grew up in families unable to afford education for their children. Over half of MIMA’s clients only completed primary school and less than one quarter completed secondary school, thus inhibiting their abilities to compete for the few jobs available.